Farha asks: Hi I have tried your reetha-shikakai shampoo. It works fine but since I got an extremely oily scalp could you please suggest me what can I use for oily scalp? Also, I have dandruff too. The simple answer is make reetha-shikakai shampoo more concentrated. So cook for more time and you can also add 2-3 extra reetha berries, and as it is a great natural cleanser. The other option is to use homemade egg shampoo. I have fine, oily hair that tends to sit flat and egg shampoo cleans my hair beautifully, and adds lots of volume, texture and shine into it. I absolutely love egg shampoo. The easiest way to make an egg shampoo is to crack open 1-2 eggs (depending on your hair), whisk it. Massage into your hair and leave it on for 5 to 10 minutes, then rinse off. 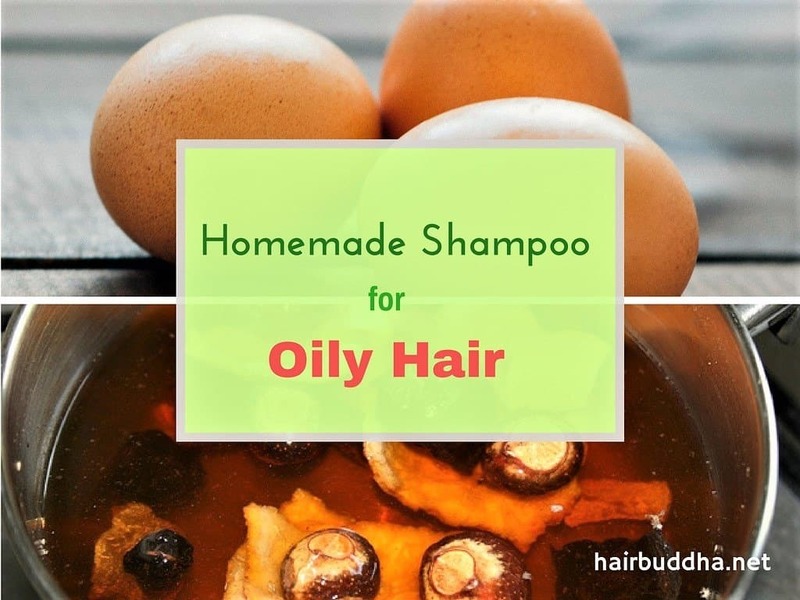 Since you mention that you have dandruff add 1 teaspoon of olive oil and 2 to 3 drop of lavender essential oil when whisking the egg. Bonus tip: After you wash off egg shampoo, condition your hair with herbal hair rinses such as reetha-shikakai, rosemary, chamomile or green tea. This will give an extra clean feel and leave your hair smelling and looking great. For dandruff, you can also use this miracle hair mask. With just one application you will find a noticeable difference in your dandruff. And this mask also promotes hair growth and makes hair strong and shiny. Besides, include probiotic-rich foods such as yogurt, homemade pickles, chunda, and saurekraut in your diet. They supply your body with healthy bacteria which then gets rid of dandruff-causing fungus. Have you ever used an egg to wash your hair? Do you like it? Hello Joan, you can add either fenugreek seeds or marshmallow root. Should you apply the egg shampoo from root to tip or just focus on the roots? From root to the tip and if your scalp is oily focus on the roots. Hello this works great to my hair my only problem is with oiled hair.I want to know when do i apply fuller earth or besan with the shampoo or before.And other suggestion to remove oil and i dont want to apply eggs m vegetarian. Hi, you can apply both ways, apply mutani mitti paste first, rinse then apply the shampoo. Hey ? I also have a oily scalp/hair and for me oats water works really well. I put 2 tablespoon oats in 2 cups boiling water. Leave it to cool and strain. I put it through dry hair and rinse after 15 min.